Sorry to rub it in again. I assume by now if you’ve kept up with our coverage of all things Kelly Slater Wave Pool (aka Surf Ranch), you’re well aware that several months ago Zach and I had the opportunity to surf the place for ourselves with a few other surf media keyboard mashers. I mention it only to bring up one piece of information that struck me, but that we did not include in our coverage. In the locker room of the Surf Ranch, there’s a little chalkboard that reads “Forecast” and along with air and water temp info, prevailing wind, etc. the board reads “4-6ft. good to epic.” I rolled my eyes when I first saw that, and I roll my eyes again now thinking about it. 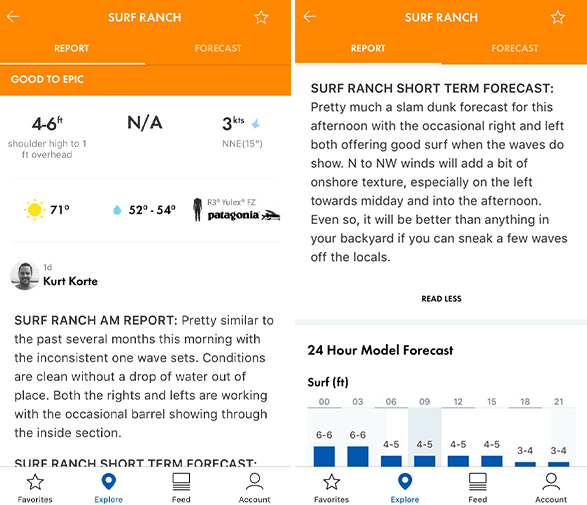 Well, recently it came to my attention that Surfline has left users a little Easter egg in their app that is as funny as it is smug given how exclusive the Surf Ranch is and what we know about the cost (for the moment) to ride it: $9500! They have a forecast for Surf Ranch that will forever read 4-6ft GOOD TO EPIC. No tide info is available, because: duh! Tune in to Surfline see what the rest of the forecast for Lemoore looks like.